Purchase Russian train tickets online safely and securely with RussianRail. Serving the public for 10 years, RussianRail offers discounts on Moscow-St. Petersburg, Trans-Siberian and other popular routes. and more, at least 20 trains daily! RussianRail.com is dedicated to bringing you up to date information on Russian train tickets and Russian train schedules. Over the years we have helped thousands of customers with their train travel in Russia. To begin, just enter your route information in to our train ticket search engine and submit. Please be aware that frequently, trains do not leave every day, therefore you may have to enter in a few dates to find exactly the train that you are looking for. Besides providing schedules, RussianRail.com can purchase tickets for you and deliver them to your home or office. Visa Invitation is the major document required to apply for Russian Visa. 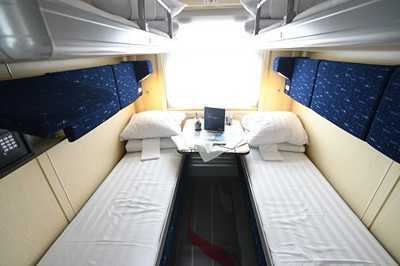 The new carriages have been developed by the Transmashholding for the Russian Railways. The presentation of the modernized 2nd class cabin takes place at the Rizhskiy Railway Station in Moscow. We booked our train from Moscow to St Petersburg using tour operator Express to Russia. I must state how impressed and pleased we were by the efficiency and help we received in booking our train. Je tiens à vous dire combien j'ai apprécié vos services, tant pour l'obtention - si compliquée - des invitations nécessaires pour les visas que pour l'achat des 7 billets de train de notre périple de Moscou à Vladivostok. I was very happy with the bookings you made for me. I always got a response within 24 hours and the answers were clear and accurate. If you are a Facebook user, we invite you to become a fan of our company on Facebook and read Russian news and travel stories. On this page, you can also learn more about our tours, get special offers and read reviews from our past customers. To become a fan, click here. We also just launched our own Russian Travel, Culture and Literature Club on Facebook. The club was created to be a place for everyone with an interest in Russia to get to know each other and share experiences, stories, pictures and advice. Here you will also learn about interesting events taking place in Russia, lectures on Russian culture, Russian language lessons with native speakers and more. To join our club, please follow this link.